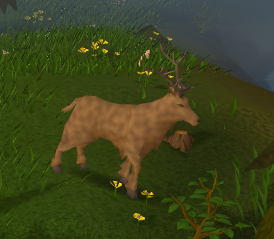 The Enchanted Valley, also known as the Enchanted Forest or Centaur Valley, does not have much going on inside, but it sure is an interesting place to visit in RuneScape. Make sure you have your Dramen Staff equiped, and then go to one of the Fairy Rings located around Zanaris, type in the code B K Q and the ring will do its power, bringing you to the Enchanted Valley! 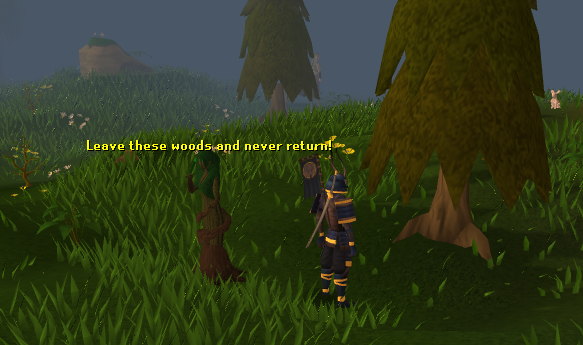 Note: Make sure you have started A Fairy Tale Part 2: Cure a Queen and have to permission to enter the forest. There's not really alot of stuff here apart from some magical creatures which really make these forest mystical and magical. 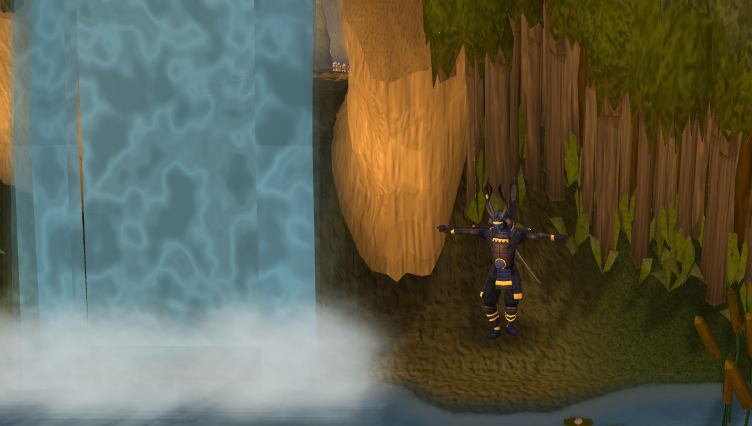 This is the first thing you will see when you walk out into the forest, you can actually walk underneath it! These trees are heavily guarded by Tree Spirits. No matter what tree you chop down in this forest, you will always get at least one level 12 Tree Spirit and you can fight up to 6 at the same time as they will continue spawning until you stop chopping the tree or are being attacked by 6 already. They almost always drop knives, so if you like collecting knives the Enchant Valley Tree Spirits will be your best friends! There are two Centaurs that live in the Forest, one will greet you with "Welcome to our Valley" while the other one says "What a funny creature you are! You have 2 legs!" I bet some of you people do wonder what a Centaur is. Well I'll tell you: it's a funny creature that is half horse and half person. 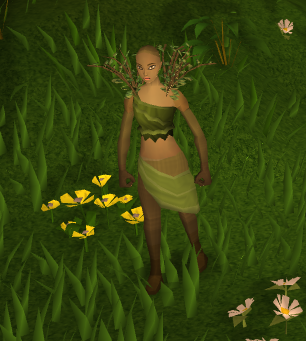 There is a lonely Wood Dryad wondering the forest, you can speak to her and ask her "Why have you got twigs growing out of your head? ", she replies "What a strange question, that's because I'm a Wood Dryad!" What is a forest without any animals? There are two animals that roam the forest, a lonely Stag and many Rabbits. Stags will only drop their bones, but rabbits will drop bones, as well as raw rabbit meat! 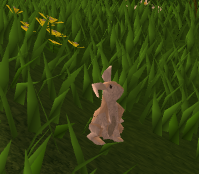 Stags are level 25 and Rabbits are level 1. South of the Centaurs you can find two mysterious rocks with no visible ores. 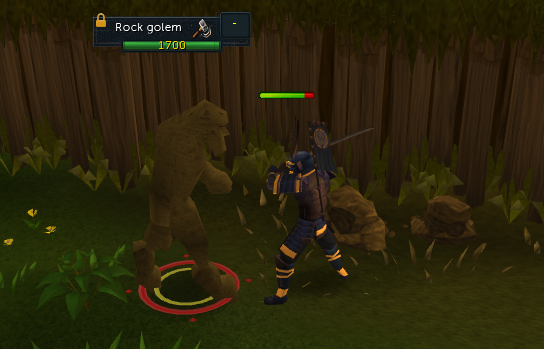 If you attempt to mine or prospect any of them an angry Rock Golem will attack. It's not possible to gather any ores from the rocks the same way you can't gather any logs from the trees because Rock Golems will never stop spawning. They are however very easy to kill and always drop big bones. 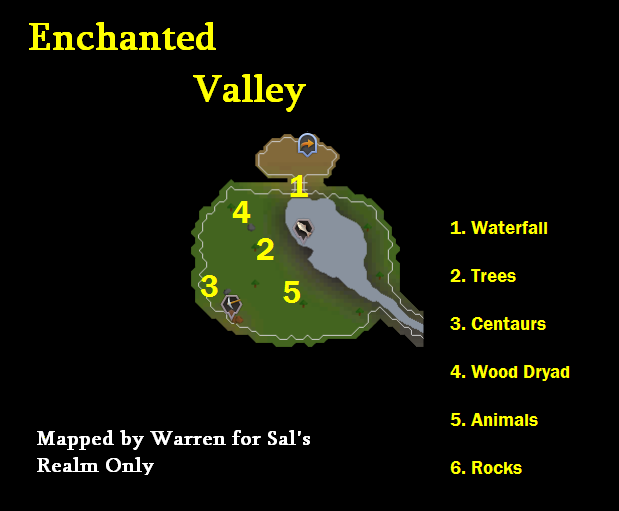 Now that you know all about the Enchanted Valley, you can explore it yourself! 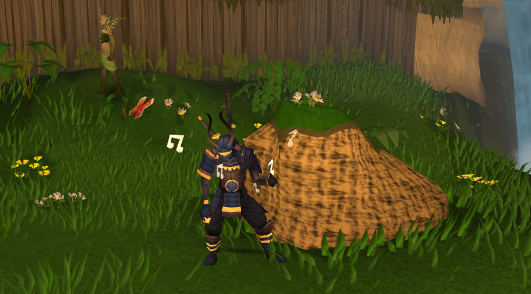 If you want you can set up your very own shrine to Nature (some people call him Guthix), or if you are the type that likes nature and animals you can set up your very own Nature Reserve.